In a visible relief to India's crucial micro, small and medium enterprises (MSMEs), the Reserve Bank of India (RBI) has introduced a one-time loan restructuring scheme for the borrowers with the total fund and non-fund based exposure of up to INR 25 crore. RBI stressed that the scheme is applicab..
Shalu had to literally fight out with her family of farmers living in a remote village in Uttar Pradesh, barely 200 kilometres from the national capital, to carry on with her education. As she passed her 12th standard, Shalu too was touched by the digital wave running through the country. She con..
A strange fear psychosis is running through the Indian corporate world. The reason is that the successful (as per global standards) Indian companies are being taken over by the multinationals. The recent case of B2B Indian major Flipkart taken over by the world's largest retailer Walmart is a shi.. The engine of growth seems to be running out of steam. Yes, we are talking about India's 60 million strong MSMEs sector. As we at SME WORLD complete 10 years of our existence, virtually nothing seems to have changed. In effect, the state of the sector has worsened mainly because of govern.. If big industry is the heart of the economy then micro and small enterprises are the arteries which supply blood to the heart for the very survival of the economy. 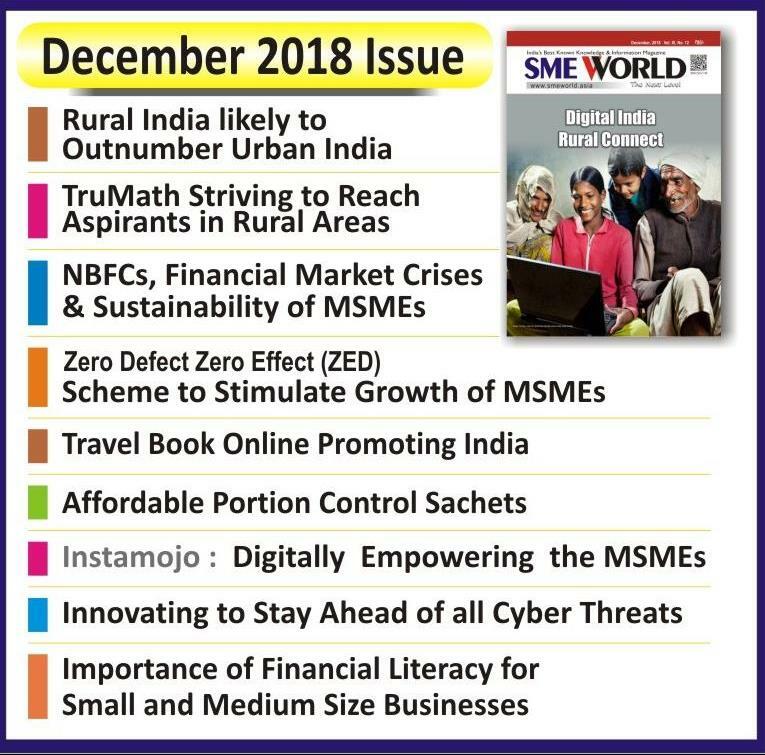 The sad fact remains that in India the micro and small industry sector is the most neglected segment resulting in the sagging..
A survey undertaken by a business chamber sometime back has revealed that one of the key factors responsible for bringing the small and medium enterprises on the verge of sickness is delayed payments by corporations. Payments not made in time invariably raise their transaction cost considerably.&.. When it comes to waging a war against pollution, India seems to have nearly missed the bus. If India has witnessed rapid industrial development in the recent past; it has come at the cost of its teeming millions as a result of increasing population. Most of the Indian big industries churn..
India, the world's second fastest developing economy, produces more educated persons than any other country in the world. According to Ministry of Human Resource Development report (2016), 21.69 lakh students received B.A. degrees, 10.2 lakhs received B.Sc., 9.48 lakh B.Com and 4.39 lakhs B.Ed de..